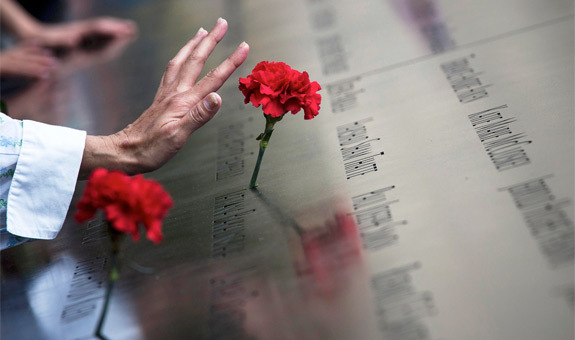 NEW YORK – September 11, 2013, Archbishop Demetrios of America conducted a Trisagion (Memorial) Service to honor the memory of all those who tragically lost their lives twelve years ago during the terrorist attacks. The service was held atop the foundation where the new St. Nicholas Greek Orthodox Church will be rebuilt. During the Memorial Service Archbishop Demetrios prayed for each of the Greek Orthodox victims and for the souls of all who perished on that day. Attending the service were Director of World Trade Center Construction Steve Plate, Superintendent of Police/Director of Public Safety for the Port Authority Police Michael A. Dedorko, Chief of the Port Authority Poloice Department Louie Koumoutsos, and a number of Greek Orthodox faithful whose family members were killed on 9-11. Clergy assisting in the service were Bishop Sevastianos of Zela, Port Authority Chaplains Frs. Andrew Eugenis and Nicholas Rafael, Frs. John Romas and John Lardas, Archdeacon Pandeleimon Papadopoulos and Deacon Eleftherios Constantine. St. Nicholas Church was the only house of worship destroyed on Sept. 11, 2001, crushed by the debris of the South Tower when it collapsed.